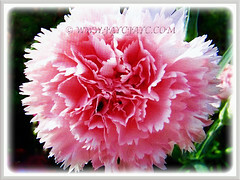 The Carnation or Clove Pink produces wonderful blossoms in psychedelic colours. 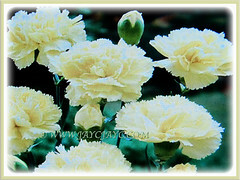 They are popularly used as cut flowers in most countries around the globe. An ornamental and perennial plant that flowers throughou the year in the tropical country. 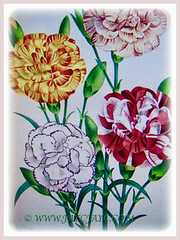 Carnation is the national flower of Spain, Monaco, and Slovenia. 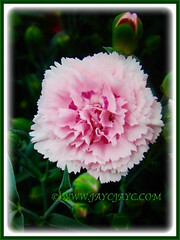 Common Names: Carnation, Border Carnation, Clove Pink. Etymology: The genus name, Dianthus is derived from the Greek words for divine dios and flower anthos citing it as the Divine Flower. It was coined by the Greek botanist Theophrastus. Origin: Native to the Mediterranean region. It widely cultivated elsewhere around the world. Features: Dianthus caryophyllus is from the genus Dianthus that consists of about 300 species of flowering plants. A favourite with hybridisers who have developed cultivars or hybrids with psychedelic colours. Dianthus caryophyllus is a weak-stemmed herbaceous and perennial plant growing up to 80 cm in height. The 15 cm long leaves are glaucous greyish green to blue-green and slender, with a waxy covering. The leaves are linear or lanceolate in shape and arranged in opposite pairs along the stems. The blue-green foliage provides a fabulous backdrop to the attractive blossoms. The flowers are produced singly or up to five together. Flowers are held in terminal clusters. They are 3–5 cm in diameter and sweetly scented. The original natural flower colour is bright pinkish-purple. However, cultivars of other colours including red, white, yellow and green have been developed. Besides, there are numerous cultivars with multi-coloured and multi-petalled flowers. Eventually, the flowers will be followed by seed capsules. Collect the seeds from the dried capsules and use them for propagating new plants. 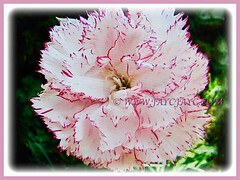 Culture (Care): Dianthus caryophyllus or Carnation can be easily grown with least maintenance. Light: Full sun or partial shade for optimum growth and flowering. Moisture: Moderate water requirements. Water regularly but do not overwater as it does not like wet feet. Soil: Humus-enriched, loamy, neutral to slightly alkaline and well-drained soils. Others: Remove spent flowers to promote continuous blooming. However, if you wish that Dianthus reseed itself, just let them be as is. Feed once fortnightly and lightly with a balanced organic liquid fertiliser, one that provides healthy growth and flower production. Generally free from serious garden pests and diseases. However, they are susceptible to crown rot if grown in wet and poorly drained soils. Try not to allow plants to be overcrowded and provide proper aeration to prevent leaf spot in hot and humid climate. For subtropical and temperate regions: Hardiness: USDA Zone 5-11. 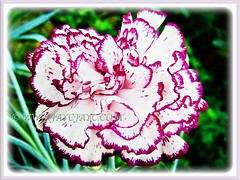 The foliage of Dianthus caryophyllus or Garden Carnation remains evergreen in warm winter temperature. 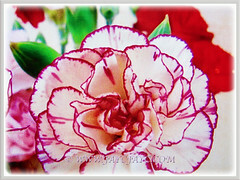 Grow Dianthus that are suited for your region. To propagate, sow seeds indoors before last frost or direct sow after last frost. Flowering or blooming period starts from mid spring to early fall. Carnations are tender perennials, meaning they cannot be counted on to survive winter temperatures that regularly drop below -18°C. 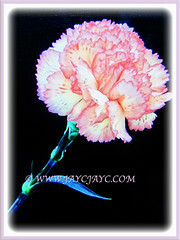 In those regions, treat the Carnation as an annual plant since there is a chance that they may return in the spring depending on the severity of the winter. Propagation: By seeds, cuttings or division of clumps. Usage: Dianthus caryophyllus or Carnation will be excellent ornamental plants to be grown in front of sunny garden beds or borders. An ideal edging and ground cover plant with its attractive and colourful flowers, especially the compact and mounding hybrids. Suitable too for container planting or above-ground planter. It’ll look impressive in rock gardens with the Carnations. 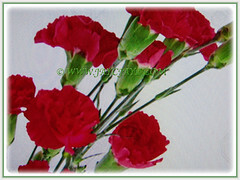 The Carnations are highly scented and popularly used as cut flowers. 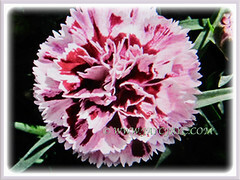 Plant Dianthus as it is a magnet for birds, bees and butterflies that help to pollinate your garden plants.